Sen. Fasano and Rep. Yaccarino are both long-time advocates for individuals who suffer from rare diseases and have worked on legislation to raise awareness and help people access treatment and research. Senate Republican President Pro Tempore Len Fasano (R-North Haven) and State Representative Dave Yaccarino (R-North Haven) attended the 2018 Rare Disease Day ceremony at the State Capitol. Pictured with North Haven resident Hunter Pageau, who suffers from SMARD, an extremely rare motor neuron disorder, Sen. Fasano and Rep. Yaccarino spoke about the importance of awareness and research in helping people with rare diseases access care and treatment. Rare Disease Day takes place on the last day of February each year. The main objective of Rare Disease Day is to raise awareness about rare diseases and their impact on patients’ lives. It also seeks to raise awareness amongst policy makers, public authorities, industry representatives, researchers, and health professionals about rare diseases. This year’s theme for Rare Disease Day focused on “Research” and the important role that patients play in gaining an understanding of rare diseases and developing innovative treatments or cures. In 2017, Sen. Fasano and Rep. Yaccarino worked to pass a state law to raise awareness for Fibrodysplasia Ossificans Progressiva (FOP), an ultra-rare genetic bone condition that affects only two people in the state of Connecticut: Holly LaPrade of North Haven and Jasmin Floyd, who resides in Danielson. 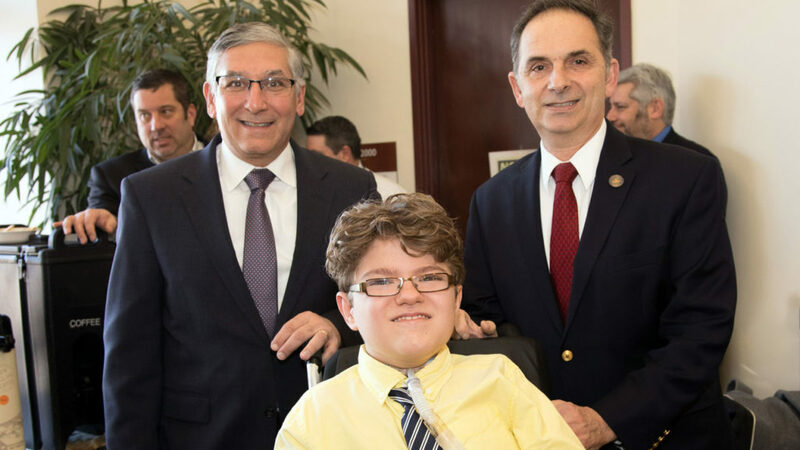 In 2015, Fasano and Yaccarino advocated for a state law inspired by North Haven resident Hunter Pageau which creates a day of awareness for spinal muscular atrophy with respiratory distress (SMARD), an extremely rare life-threatening motor neuron disorder that affects approximately 10 people in the United States. In 2013, Sen. Fasano worked with lawmakers to pass a bill to require the screening of newborns for a disease that causes rapid degeneration of the nervous system in young boys: Adrenoleukodystrophy (ALD). The bill was inspired by Brian Kelley of Branford and testing officially began in 2016. Testing has already led to the early diagnosis of multiple children to allow for early treatment. For more information on international Rare Disease Day visit: www.rarediseaseday.org.